I just hate socks, but I am worried that if I don’t wear them my sneakers will get gross and start smelling awful. 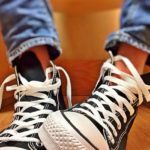 Is it okay to wear sneakers without socks? Posted August 31, 2016 under Ask Us. There is no “rule” about wearing sneakers with socks however, socks (especially a cotton blend) absorb sweat and lessens the chance of getting the inside of your sneakers wet or dirty. Sweat and dirt will make your sneakers smell bad and the inside lining may rip or tear. Bottom-line, if there is nothing between your feet and your sneakers, the fabric inside can break down. The end result is that you may have to replace your sneakers a lot sooner than usual. If you simply hate wearing socks, you may want to look for sneakers that are mesh and light weight that can be cleaned in a washing machine. You could also try using deodorizing sneaker balls (small plastic balls with an air freshener inside) which you can usually find in most stores that sell shoes. Finally after weighing the pros and cons, you might discover that wearing socks is worth it in the end.